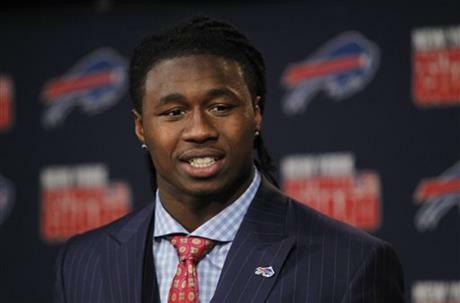 1)	Sammy Watkins: Former track star Sammy Watkins is easily the most explosive rookie of 2014. He had a huge college career going over 1,200 yards and catching 12 TDs two out of his three years at Clemson. In 2011, Watkins was just the fourth first-year freshman in NCAA history to become an AP first-team All-American, joining the likes of Herschel Walker, Marshall Faulk and Adrian Peterson. Watkins has the big play ability that allows him to create space no matter who is covering him. He possesses great hands that’ll make a mediocre EJ Manuel look good at times. And with Stevie Johnson no longer a Bill, you expect a heavy workload for Watkins right from the start. He is a threat to catch bubble screens or short tosses and take them the distance. Watkins is also a threat to return kicks, which makes him even more dangerous depending on your fantasy league scoring settings. Watkins’ only negative? His QB. Still, with other explosive players on the Bills, including CJ Spiller and Robert Woods, no defense will be able to focus solely on Watkins. He’s by far the best rookie in the draft and should be considered a low-end WR2 or a strong WR3. 2)	Bishop Sankey: Bishop Sankey – the first RB taken in May’s NFL Draft – carries plenty of fantasy upside. This potential is mainly because he is expected to receive the majority of the Titans’ carries. In 2013, Sankey was a Second-team All-American and first-team All-Pac-12 player. He broke the University of Washington’s single season rushing record previously held by former successful NFL player Corey Dillon. The youngster finished the season with 1,870 yards and at least one rushing TD in every game of the season. Sankey has average explosiveness and tackle-breaking ability, but he is a solid running back that can run between the tackles. Sankey also has solid hands out of the backfield. He was productive in college in a pro-style offense and he gets stronger as the game goes on. As long as Sankey can improve his pass blocking he should see a lot of carries and playing time. At this point, Sankey is a low-tier RB2 option but an excellent choice for a flex position. 3)	Mike Evans: The 6’5, 235-pound Mike Evans has exceptional size and ability to go up and catch the ball. Evans redshirted his freshman year of college but was Texas A&M’s leading receiver his sophomore and junior year going over 1,100 yards both seasons and catching 5 and 12 TDs respectively. Evans basketball background is evident with his ability to box out defenders and go over the top of smaller cornerbacks. Evans has good hands and should be a big threat in the red zone. His speed and separation ability are average, so he will need to be able to make a living by catching balls in traffic. Josh McCown pushed for the Bucs to draft Mike Evans to put alongside Vincent Jackson in order to try to replicate the success the Bears have with Marshall and Jeffery. Evans and Jackson present a very dangerous WR combo and they are both capable of putting up huge numbers any week. Evans is arguably as good a fantasy rookie WR as Sammy Watkins and should be considered a potential WR2 or a very good 3rd WR and RB/WR flex player. 4)	Brandin Cooks: Brandin Cooks can flat out fly. He ran a 4.33 40-yard dash during the combine and was formerly a Junior Olympic sprinter. Cooks won the Biletnikoff Award as the nation’s best WR in 2013. Cooks set two Pac-12 single-season records with 128 receptions and 1,730 receiving yards. He also scored 16 TDs in 2013 and was a threat at returning kicks. Cooks has strong hands and the ability to separate from defenders with quick cuts and blazing speed. He has big play ability and can turn short passes into long plays. Cooks’ weakness is that at 5’10, 190 pounds, he may be susceptible to getting jammed at the line by stronger cornerbacks. Luckily for Cooks, and for you, the Saints drafted him. So he is a fantasy threat with Drew Brees as his QB. Cooks should be a very good slot receiver for the Saints and with Brees slinging the rock, he is capable of putting up huge fantasy numbers. The problem with Saints WRs is that they tend to lack consistency as Brees spreads the ball around. Cooks has the potential to be a strong WR3 and could be a value on draft day. 5)	Odell Beckham Jr.: Beckham enjoyed a solid career at LSU, starting for the Tigers since he was a freshman. In 2013, he won the Paul Hornung Award as the nation’s most versatile player. He broke the LSU single-season all-purpose yards record of 2,315. He tallied 1,152 receiving yards while catching 8 TDs. Beckham was also a threat returning kickoffs and punts, going for over 1,000 return yards. Odell boasts sticky hands and quick feet. He has terrific leaping ability and has fluency to his game that gives him a lot of promise in the NFL. He does not have top speed and can be out muscled at times, but he has the potential to be a great NFL WR. The Giants have a solid WR group with Victor Cruz, Rueben Randle and Beckham, so do not expect Odell to receive an astronomically high amount of targets. With Cruz in the slot, the rookie is ticketed for an outside role. Look for Beckham to benefit from a bounce-back year from Eli Manning and post WR4-type numbers. 6)	Eric Ebron: Eric Ebron didn’t play very much his first year at UNC and he had an average sophomore year. But in 2013, Ebron emerged as a superstar TE. He ended the season with 973 receiving yards, breaking the ACC record for yards by a TE previously held by Vernon Davis. Ebron has good size at 6’4” 250lbs and is a pure athlete. He’s a great route runner and has surprising speed and quick feet for his size. He has a huge catching radius along with tremendous hands. He is not the best blocker, but in the Lions’ pass happy offense, he should fit right in. At UNC, Ebron typically beat single coverage against cornerbacks. He is a mismatch in the seam and if covered by a linebacker or a safety, Ebron should win that battle more often than not. Because of his size, Ebron is a red zone threat and he should thrive in Detroit’s offense. Playing alongside Calvin Johnson, Golden Tate, and fellow TE Joseph Fauria, Ebron will be a matchup problem for defenses league-wide. Ebron is a solid fantasy TE who should come off the board in the mid to late rounds of drafts. 7)	Johnny Manziel: After redshirting one season, Manziel went on to become the first freshman in NCAA history to win the Heisman, the Davey O’Brien Award and the Manning Award. As a freshman he threw for 3,706 passing yards with 26 TDs and rushed for 1,410 yards and another 21 TDs. In 2013, all he did was follow this up by throwing for 4,114 yards with 37 TDs and rushing for 759 yards and another 9 TDs. Combined, Manziel set 35 NCAA, SEC or school records in his two-year career. Manziel is an unbelievable athlete and a dynamic player. He has big hands that allow him to strongly grip the ball. He’s a dangerous scrambler and can throw the ball accurately on the run. Arm strength and a competitive drive round out his strong suits. His weaknesses are his size and the amount of punishment he takes. Certainly, they can lead to injury troubles in the NFL. He is an unorthodox player and has been in questionable off the field situations. Nevertheless, the Browns aren’t likely to roll with Brian Hoyer for long. Cleveland has a Week 4 bye, and it would be a surprise if the rookie isn’t starting the following Sunday. Manziel is a dynamic player who will carry a ton of upside as a fantasy backup.